On a mountain ridge 1000ft above the Pokhara valley, the gateway to the famous Annapurna Circuit, the lodge and views are simply stunning. Relax pre- or post-trek, and enjoy the staggering scenery in serenity at this homely retreat which raises the bar for responsible tourism in Nepal. Opened by Sir Edmund Hillary, Tiger Mountain Pokhara Lodge has stunning panoramic views of Machhapuchhare, Dhaulagiri, Annapurna and Manaslu peaks, the latter three among the ten highest (over 8,000m/26,000ft) mountains in the world. The setting is dramatic: Within 30 kilometres (19 miles) of the valley, the mountains rise from 1,000 to 7,500 metres elevation (3,300-24,600 ft). The altitude of the lodge is about 1,220 metres (4,000 ft), a little lower than Kathmandu. Unsurprisingly adventure activities on the doorstep abound. Until the 1970s, Pokhara was a small bazaar town with charming locals largely known only by occasional travellers trekking in the Annapurna Himal. The largest lake in the valley, Phewa Tal, became first a camping ground for trekkers and gradually developed into the tourist hub of this growing city. Now considered the adventure tourism capital of Nepal, Pokhara’s long lake border is home to a variety of restaurants, bars and shops. It was on the lodge’s dramatic hill top that Gurkha officer, war hero, reputed climber and founder of the first trekking company in Nepal, Mountain Travel, Colonel James O.M. Roberts MC, had assessed sites for radio masts to transmit impending election results to Kathmandu, subsequently remembered in preparing the route for, and so popularising, the “Royal Trek”, the first of HRH the Prince of Wales in 1979. Recommended stay a minimum of 3 nights. 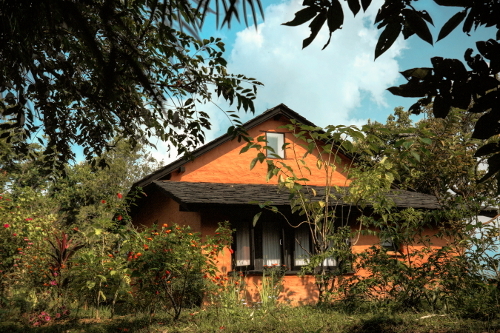 Comfortable and relaxed boutique lodge a half-hour drive from Pokhara. Ideal for peaceful retreat and privacy - set in hilltop natural gardens. Design and local materials blend into landscape and maximise breath-taking views. Stunning viewpoints to enjoy a drink or meditate on majestic peaks. Secluded infinity swimming pool reflects the famous Machhapuchhare peak. Colonel Jimmy's Library eclectic collection of Himalayan mountaineering literature. Understated elegance of cool slate, parquet floors and handmade wood furniture. With just 18 rooms, the lodge offers simple comfort and attention to personal service. Adjoining bathroom with shower, chappals and bathrobes. Hand-made soap contains only olive, palm and coconut oils scented with citronella, a natural insect repellent ( stocked in the shop to take home and evoke memories!). Rooms are sprayed with natural citronella as a mosquito repellent: Anti-mosquito coils are provided in hot weather but are harmful to the environment, so it is preferable to keep your room door closed in the late afternoon. Dress is casual and relaxed, light cotton and other natural fibre clothing recommended. Large windows and glass double doors maximise the glorious views of the amazing mountains, with no TVs to preserve the tranquillity of retreat. The lodge asks that telephones are not used and are in silent mode outside the bedrooms. There is free wi-fi available in the main lodge area and complimentary wi-fi dongles or mini hubs for bedrooms. Terraced natural gardens planted with indigenous shrubs, bamboo and fruit trees, and are a haven for wildlife. Terraces offer spectacular meals al fresco, the typical Nepali-style courtyard around the cosy fireplace and bar of the main central lodge. The bar is open throughout the day until the last guest retires and stocks a range of soft drinks, beer, wines, local and imported spirits with interesting cocktails. In the library are novels to swap, newspapers, magazines, periodicals, wildlife field guides and a selection of scientific papers on Nepalese conservation issues. Original water colours of the region by British artist, Luke Piper. Cool slate, parquet floors and handmade wood furniture top off the understated elegance. Award-winning meals in the airy dining room offer good home-style food, local, organically grown to the highest standard. Fresh herbs, salads and vegetables come from the lodge’s own gardens, other fruits and vegetables from the village. All food is prepared daily on site. All meals and non-bar hot drinks are included in room rates. As the sunrises over the Himalaya you’ll start the day with room service of morning tea. Home baked breads complemented by Nepalese honey and homemade marmalade or jams. Fresh fruits and juice vary with the seasons; cereal, muesli, yoghurt, porridge (in winter months), eggs and a selection of cooked options are available. Nepali buffet with a range of authentic dishes and homemade Aachar (chutneys) using local spices with fresh rotis (flat bread cooked over an open flame) or puris (a fried bread) and papad (poppadum). Fresh salad, soups, sandwiches and other light snacks are available on request. Picnics are available for eating away: For breakfast, masala omelette roti wrap and bacon sandwiches are well acclaimed! For lunch, freshly made sandwiches with tempting nibbles such as vegetable quiche, samosas, devilled eggs, pies, roti-wraps, cake, seasonal fresh fruits and fruit drink are available. including best Nepal Ilam tea (similar to Darjeeling), fresh organic Nepalese coffee, organic green tea from east Nepal and home-grown herbal infusions, and a range of snacks, sandwiches, homemade cakes and biscuits are always available at the main lodge or the privacy of your veranda. The menu changes daily and features a range of European dishes or traditional Nepali Thali. The kitchen welcomes requests for personal favourites, special dietary needs, children and vegetarians. The lodge supplies purified water during meals, in flasks by beds and in bathrooms, and for ice at the bar. A supply of flasks is available for you to fill and take out: By refraining from purchasing mineral water you help to reduce the approximately 100,000kg of water bottles per year, plastic which cannot be effectively recycled in Nepal. The lodge is an excellent base for diverse activities in the mountains and valley. Guests do as much or as little as they please, often whiling away hours just contemplating the Himalayan peaks. Please remember to keep with you all litter, including cigarette ends, which can be unsightly and a hazard for fire and animal welfare. Local walks and village visits: Led by expert local guides to explain the flora, fauna and local area environment as they take you through local villages, forest and farmland. Birding walks: All the guides are keen ornithologists - over 350 different species have been sighted by the guides from the lodge and around the Pokhara Valley! Wearing muted “earth” colours (green, beige, brown) is best to maximise sightings. Butterfly watching (with a guide to help identification): there are over 260 species of butterflies in the lodge grounds alone! Longer walks of 3 to 8 hours: Possible directly from the lodge, and of course multi-day treks are well integrated with pre- and post- stays at the lodge so you can prepare in comfort or rest your weary muscles. Relaxation: by the pool; with a range of massage treatments available in the privacy of your own room; personal yoga sessions, or meditation training in view of the majestic white peaks? Colonel Jimmy's Library A unique and eclectic collection of Himalayan mountaineering literature and photographs belonging to the late Col. J.O.M. Roberts. Artists' retreats are popular, such is the rich cultural experience of rural Nepal village life, and the setting’s tranquil inspiration for creative art and writing. Please bring your own materials, as artists’ supplies are not readily available in Nepal. Gift Shop: Organic coffee, speciality Nepalese teas, handmade natural soaps, essential oils and spa treatments, paper, chutney and preserves, pashmina and traditional print items, traditional Newari artefacts and bronzeware, Tiger Mountain T-shirts and branded items are for sale and all contribute to the local economy and causes. The World Peace Pagoda (Shanti Stupa) on the ridge to the southwest of Phewa can be a good half day excursion. You can ride across the lake, then take a steady but steep hike through the Raniban (Royal Forest, a good place for birdwatchers) for an hour or more to the stupa. You can walk back down or be picked up by a lodge vehicle. Paragliding is an exciting adventure and novel way to see the Pokhara Valley and mountains, at times even joined in flight on the thermals by eagles! Professionally run and monitored by the Civil Aviation Authority of Nepal, tandem introductory flights and courses for those who wish to go solo. (A greener option as paragliders use no fuel). Micro-light flights of 30 minutes and 1 hour are available to see the famous “Fish Tail”, Machhapuchhare or other peaks in the Annapurna Range are also professionally run and supervised by the Civil Aviation Authority of Nepal. The company provides flying suits, briefing and all requirements; just remember a camera! Boating on Lake Phewa: By the former king’s residence, take a ferry to the Bhindubhasini temple on an island in the lake or hire a paddle boat, with or without a ferryman, for one hour to a whole day. White Water Rafting: Seasonal rafting trips are available on the rapids of the upper reaches of the Seti River from the confluence with the Mordi River: A 45-minute drive north of Pokhara followed by a 2-3 hour descent of a series of rapids. Museums: Visit the International Mountaineering Museum, the Annapurna Natural History Museum for those interested in Nepal’s butterflies or the Annapurna Conservation Area Project, or the Gurkhas Museum with its interesting collection of Gurkha militaria. As part of its commitment to the community and Nepal, staff have recorded basic weather data since 2004. Daily readings at 0845 and 1745 Nepal standard time log the maximum, minimum and actual temperature, barometric pressure and relative humidity in the format required by the government Department of Meteorology. Nepal’s climate is dominated by the annual monsoon cycle in six seasons of 2 months. 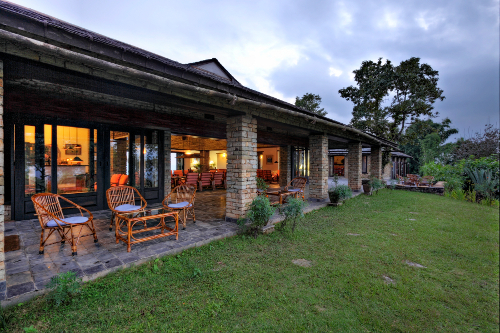 The Lodge’s hilltop location ensures a cool breeze even in the warmest weather compared to the valley floor. Winter: Mid-Dec to mid-Feb, 13-22°C Cold nights, warm days. Tourism makes a major contribution to the Pokhara economy and income for local people, and Tiger Mountain Pokhara Lodge takes its people priority, social responsibility, governance and accountability very seriously. Tiger Mountain Pokhara Lodge believe in education for true responsible tourism: A sustainable natural and social environment can only be achieved effectively if all stakeholders (staff, guests, suppliers, community, authorities...) are fully informed and aware of the issues, take the required responsibility and make a personal commitment. The staff at the lodge are attentive, accommodating and knowledgeable; you might hear them say ‘Atithi Deva Bhava’ - Guests are Gods. 97% of the staff have been with the lodge over 8 years. Staff Loyalty: The majority of the staff working in the lodge today formed part of the 350 local male and female labourers, craftsmen and overseers who originally built the lodge: The in-house experience, expertise and teamwork is immense. As such, all staff in front-of-house and behind the scenes work equally, contribute equally and share the tip box proceeds equally, including all guides, drivers and lodge staff. Employment practices go far above and beyond the Nepali legislative requirements. Free board and lodging is provided, service charges are remitted to staff monthly (the requirement is 6 monthly in arrears), even in advance for those in need during festivals, with a bonus of one-month’s pay at Dasain, the major festival in Nepal. Tips from guests paid by credit card have no commission deducted, and the Lodge prioritises all appointments for applicants from the immediate community, actively encouraging the recruitment of women and individuals from disadvantaged groups. Teamwork: Staff are also encouraged to participate and voice ideas on how the company can become more sustainable, encouraging a bottom-up approach and sense of ownership of the initiatives through the lodge’s Sustainable Action Group which monitors the implementation of the company’s responsible tourism policy and pilots projects with the local community, for example in refuse management. Connection: the Lodge acts as an interface between the community and guests, believing in a two-way flow of mutual support, raising understanding of the lodge’s responsible tourism activities within the community through its local staff. The local and wider community are always encouraged to visit and learn about sustainability through a lead-by-example approach and guided tours of the lodge and grounds. The local community is consulted wherever Lodge activities may have an impact. Educating: Guests are informed about minimising fuel, water and chemical consumption and reducing waste through the welcome briefing and the room information pack and encouraged to give feedback. Guests are encouraged to see, participate where appropriate, and learn about the local community, with no tolerance for all forms of exploitative behaviour. Dress: Nepal is a conservative society. Guests are asked to dress appropriately when out on activities in the village or further afield: ladies with clothing to the knee and tops not low cut or revealing; generally the upper arms should be covered; gentlemen should avoid skimpy shorts and should wear a shirt or T-shirt that covers the torso. Photos: The Lodge is happy to print and distribute pictures to the local villagers, however always ask permission before photographing local people. Most will be more than willing, but it shows respect to be asked first. Meeting locals: When you’re out and about in the area, you’ll often be joined by children from the community on their way to/from school, intrigued with tourists and keen to practice English. It's great to interact, but not to give sweets, money or gifts – it is not a good example to set, only encouraging begging, skipping school and bad teeth. If you wish to support them, please let the lodge know, who can ensure any contribution ends in the hands of the most deserving. Village: Tiger Mountain Pokhara Lodge is situated in Kandani Danda, settled approximately 200 years ago with migrants from north-west Kaski District and other areas. It developed into a predominantly Brahmin and Chhetri community of Sigdel, Neupane, Dhungana, Thapa, Bhandari, Ranabhat, Rajbhat, and Raibhat clans and other supporting occupational castes, such as Biswokarma and Pariyar. Current population of the settlement stands at about 1000. Community Support Partnership: An active programme works with the local community to support locally-based and -led projects for community development. Water Access: The families who sold land for the construction of the lodge were not just paid but also provided with private water taps and most have at least one person employed at the lodge. The village permitted the use of a spring 1000ft below the lodge, which ensured public benefit via two public taps from this otherwise inaccessible source of water. This has education benefits as well as health: freeing girls’ time for school that would otherwise be demanded for fetching water from a distant spring. A new water supply system is since in place and the public taps remain a backup. Public rights of way are respected and access is provided to local families to cut grass for fodder and, subject to the lodge’s own requirements, thatching. Responsible Business: The lodge also prioritises local purchasing for food at a fair price, preferably paid on an immediate cash basis (where credit is taken, at the month end), and for activities, restaurants, shops and well-being services for guests. "The communities in which Tiger Mountain Pokhara Lodge is privileged to operate are our stakeholders, vital partners in the business" - Marcus Cotton, Managing Director. Tiger Mountain Pokhara Lodge endeavours to develop and improve its commitment to guests, employees and the local community through its focus on health, education and environment. Tiger Mountain Pokhara Lodge fully supports and practices responsible conservation tourism, in an environment where availability of alternatives can be challenging. Operating in the middle hills of Nepal where the surrounding area is under diverse pressure, there is a need for sound and sensitive management. The lodge undertakes a range of biodiversity monitoring projects and supports various social development and welfare activities on an ad hoc and ongoing basis. Designated Community Support Partnership staff encourage community involvement. First Aid: Although close to regional facilities in Pokhara, self-reliance for simple medical conditions and first aid issues are essential to not over-burden the city hospitals. To this end, the Lodge has a first aid facility, ambulance for emergency cases and have supported the local Nepal Red Cross branch to construct a meeting hall as a training and disaster-preparedness centre. Medical support: Tiger Mountain Pokhara Lodge also provides logistic and management support at no cost to help families access the best available medical treatment. Staff and guests regularly support local families in difficulty, such as with medical cases, and also housing and education. Primary and secondary education: Tiger Mountain Pokhara Lodge supports the local community's schools, including the salary of one teacher (as the government budget cannot provide sufficient) and provision of teaching materials, books, paper and posters. Generous guests over the years have helped build this rapport between the Lodge and schools. This has ultimately enabled classes to be taught to School Leaving Certificate level, a particular benefit for girl students as they can complete their education within the community, and facilitating a volunteer mentor programme to enhance the schools teachers’ own English and teaching-in-English language skills. Staff support: The Lodge provides staff an education allowance to subsidise costs of up two children from kindergarten to School Leaving Certificate (approximately age 17). Construction: It has also enabled the rebuilding of Amar Jyoti Secondary School block beyond that available from the local government education budget, with improved desks, well rendered classrooms, blackboards and electricity. Sponsorships: In addition, the Lodge manages the guest-funded sponsorship of various children from disadvantaged backgrounds who would otherwise not go to school, plus hosts study groups, government and non-government tours such as from Afghanistan, Mongolia, Tibet and Cambodia, keen to learn about the sustainable tourism development model at Tiger Mountain Pokhara Lodge. Mains electricity is used, rather than an independent renewable source, because the majority of electricity supplied by the Nepal Electricity Board is generated by hydropower thus a clean, green solution. However, regular power cuts mean the Lodge is forced to run a backup diesel generator to maintain high standards required for tourism operations, but only used minimally when required, regularly serviced to ensure maximum efficiency and metered to log power generated. Lighting: A lack of durable low energy lighting available in Nepal led to traditional light bulbs being replaced by low energy compact fluorescent lighting, gradually to be switched to LED lights as bulbs need replacing. Consumption: Lights, machinery and computers are switched off whenever not in use and set with energy savingoptions when possible. All fridges are energy efficient models. Solar power: is used to heat hot water for the staff and 2 out of the 19 guest rooms, to be extended in future although possibly not for all rooms due to topography. Kerosene lights the pathways and heats guest rooms on request. The lodge’s fires are minimally lit and burn off-cuts supplied by the local timber mill or timber sustainably harvested within the lodge grounds. Transport: All vehicles are regularly serviced to minimise emissions and all activities are structured to minimise usage, with staff encouraged to use public transport where possible. Conservation of water is of utmost importance, as it is pumped over 300m (1,000ft) to the lodge. All toilets have a shortened flush and the majority of taps are fitted with aerators. Flow rates of all taps, showers and toilets are monitored. Leaks are fixed as soon as possible. Irrigation of the gardens occurs mainly after sunset, and occasionally at sunrise, to avoid evaporation in hot weather. Water meters are installed to log consumption. The pool is filled by a mixture of direct rainfall - storms can overfill the pool - harvested rainwater from the main tank, and well / spring water. The laundry and swimming pool are water consumption reduction priority areas, with work in hand to install three constructed wetland (CW) reed-bed natural filtration plants: one (pending technical considerations) to process kitchen grey water for garden irrigation; one to re-filter the pool water and one (pending land purchase) to process laundry water to allow it to be recycled for rinsing. At Tiger Mountain Pokhara Lodge, all waste is managed in an environmentally sound manner. Metal, waste oil and glass is sold to local kawarris (recycling agents) who then sell this on to India for re-processing (unavailable in Nepal). Beer and soft drink bottles are returned to local breweries or bottlers. Aluminium, copper and brass are melted down locally and reused. Plastics where possible, are sold to recycling agents who sell it on to companies re-using for manufacture of bags and plastic pipe. All money earned from recycling is divided equally among the staff to give an incentive to recycle as much as possible. All guests are provided with sterilised water and flasks mitigating the need to purchase mineral water that generates waste plastic. Waste food is composted when suitable, eaten by neighbours’ cattle or devoured by staff members if it tickles their fancy! Cloth is reused until it is unusable then along with paper it is burnt and the ash is composted. Cloth bags and vegetable crates are used to carry shopping, in order to minimise plastic bags. Wind up torches have been introduced in all guest rooms, reducing the need for batteries. All guest soap is natural and environmentally bio-degradable. Chemical cleaners are kept to a minimum for hygiene-specific use. No aerosols such as air-fresheners and no chemical furniture polish is used. Laundry soap is currently detergent based so minimally used due to non-availability of effective alternates in Nepal. Hand washing and sun drying minimises energy usage. In the gardens, only compost, animal manure, and organic fertilisers. The lodge is maintained where possible using products that have no detrimental effect on the environment: Rendered exteriors are traditionally plastered with a mud and cow dung mixture. All exterior wood is maintained with a natural turpentine and mustard oil mix, furniture is protected using traditional chopra and walls are painted with traditional red emulsion consisting of all natural ingredients. Unfortunately the lodge is compelled to use standard white emulsion indoors as Nepal is yet to have environmentally friendly paint. The swimming pool is kept clean with a salt-based sanitiser that has significantly reduced chlorine from bleach by over 90%. Designed and built in-keeping with local traditional architecture, with raw local stone from the community quarry, government -approved rich Sal (Shorea robusta) timber from the Nepal Terai plains, and pine from the western hills, to blend into the landscape. Traditional mud mortar is used where practicable and cement mortar only where load or other engineering need makes it necessary. Lodge construction: All building complies with regulations and the needs of the disabled are also taken into account with dedicated staff also allocated to support needs as far as natural topography permits. Grounds: The gardens and woodland areas are kept to natural biodiversity, only planted with indigenous and naturalised shrubbery. The hilltop between the swimming pool and the main lodge is set aside as a natural Khar Bari, a field for traditional thatch grass. This retains natural land use patterns and is beneficial for bio-diversity. The wooded areas are managed with occasional and minimal selective thinning. Erosion evasion: The appropriate planting and regular monitoring of the property ensures that everything possible is done to mitigate human-induced potential erosion risks. All storm-water run-off is controlled for the same reason. The vegetable gardens are as much a nursery to encourage local farms to grow for the lodge, to expand its economic benefits in the community beyond direct employment –a key policy objective. Tiger Mountain Pokhara Lodge works closely with local partners, national, and international charities, emphasising community-based and -led organisations to develop and support local environmental enhancement projects. Non-timber forest products for planting on the open land on Shillinge Chaur and other areas. Broom grass (Amrisu), bamboo, banana, and some shade trees have been planted to provide a cash crop to complement the timber resources of the main forest. 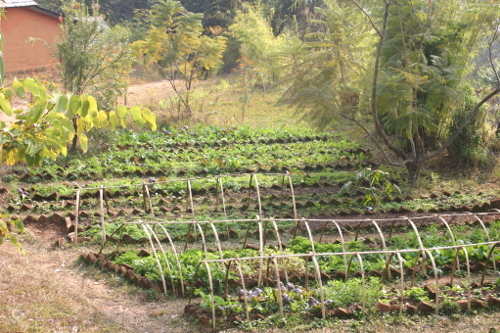 a forest nursery to grow timber and non-timber seedlings. The Lodge funds the wages of a forest ranger who patrols the community forest to prevent poaching and illicit felling. Vulture and Raptor Monitoring: A joint project with Tiger Tops Tharu Lodge. Vultures have declined catastrophically in recent years due to use of veterinary drug, Diclofenac. Data monitoring to see if efforts to manage the use of the drug are having a positive impact. Annual Asian Waterfowl Census (every January): A joint effort between Tiger Mountain Pokhara Lodge, ITNC, Bird Conservation Nepal, and other local charities. Since 2005, data has been provided to Bird Conservation Nepal and thence to Birdlife International. Monthly Butterfly Monitoring: Butterflies spotted around the lodge are monitored as good indicators of bio-diversity: The range of species and their relative abundance is a sign of a healthy environment. Guides at the lodge conduct a monthly survey within the grounds, and the data made available to researchers. On just one Budleia Bush (B cylindrica) they witnessed an amazing 54 species in one day, including, over the flowering period, several new and rare species. One moth spotted, Actias maenas, has a wing-span of 6 inches! Tiger Mountain Pokhara Lodge really sets the standard for responsible Tourism in Nepal, a real haven, a spiritual sanctuary to restore the soul. Included: Accommodation, all meals and snacks, non-bar hot beverages (tea, coffee, hot-chocolate), arrival and departure transfers from / to Pokhara, services of guides. Payment due 45-15 days prior to arrival (on arrival by special arrangement) Visa or Mastercard.